Blue Öyster Cult, often abbreviated BÖC, is an American rock band, most of whose members first came together in New York in 1967 as the band Soft White Underbelly. The group is well known for songs including "(Don't Fear) The Reaper", "Burnin' for You", "Godzilla", "Cities on Flame with Rock and Roll", "Veteran of the Psychic Wars", "Astronomy" and "This Ain't the Summer of Love". They have sold over 24 million albums worldwide – including 7 million in the US. 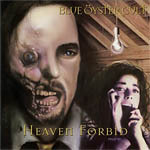 Heaven Forbid is a Blue Öyster Cult album released in 1998. It was the band's first studio album in a decade (not counting the 1992 soundtrack to Bad Channels). American science fiction and horror writer John Shirley wrote lyrics for several songs on the album. While he is a noted author for his cyberpunk stories, many of the lyrics on this album revolve around early science fiction and mystery motifs. This album's working title was Ezekial's Wheel, after the Biblical story that may or may not reference an early visitation by UFOs.